This is not a fairy tale. A Nigerian artist, Eli Waduba based in Kaduna, put out a message on Twitter about his painting asking for people to retweet it so that Kevin Hart would see it thousands of miles away in US. Fast forward two days later after many retweets from people, it finally gets to Kevin Hart. And the American comedian has promised to support Eli by paying him to do a pencil drawing of 3 of his celebrity friends. 26-year-old Eli Waduba via is handle @EWaduba tweeted: "My name is Eli Waduba Yusuf. Am a Nigerian, based in kaduna. 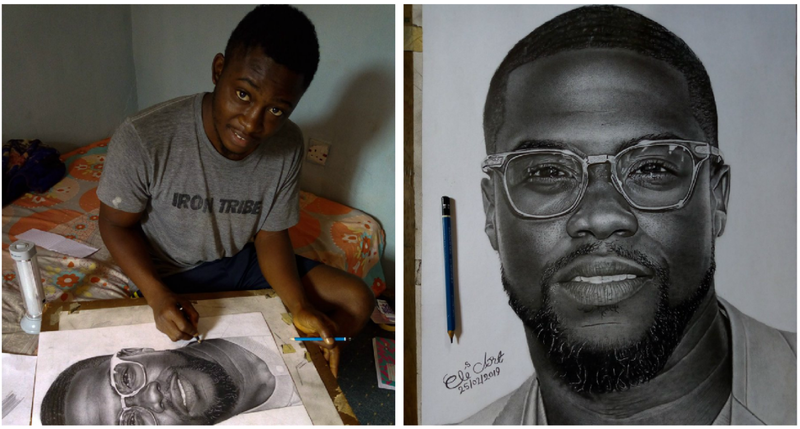 Am a hyperrealism PENCIL Artist, I hope to become like @Harinzeyart. Please Retweet, let @KevinHart4real see it, thank you"
Eli told CNN that he hoped that Hart would see it and actually believed he would see it someday. “It has been so overwhelming and words cannot describe it. Kevin Hart has always been my favorite comedian. Waduba is a hyper-realism artist and a Cooperative Economics and Management graduate of the Kaduna State Polytechnic. This shows the power of social media and the limitless possibilities available.